and related information appears on page 3. 4Beginning with the first quarter 1984, copper-base powder mill products were not collected. 5Source: Bureau of the Census Current Industrial Report, M33E(85)-1, Nonferrous Castings, issued April 1985. 6For 1983, this report was collected on an annual rather than a quarterly basis. Source: Bureau of the Census Current Industrial Report, M33E(83)-13, Nonferrous Castings, issued February 1985. Nathaniel A. Shelton, (301) 763-5547. Wire, uninsulated, bare, tinned, and/or alloy coated. 7Source: Bureau of the Census, Current Industrial Report M33E(85)-1, Nonferrous Castings, Issued April 1985. 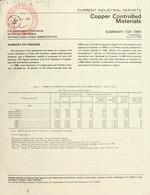 6Data for 1983 include figures for copper base powder mill products. Sheet, strip, and late ...................... 612. IThe import and export numbers fir thi,. 1 im *t t nc l1mhr wire.